WALNUT SHADE, Missouri, Jan. 18, 2014 – Copper Run Distillery takes whiskey making to the next level. Following the success of the “Ozark Mountain Moonshine”, Copper Run Distillery is happy to present its new offering of white whiskey. The “Overproof” Ozark Mountain Moonshine! Copper Run has created a new experience in the white whiskey category. This 120 proof white whiskey is distilled and blended from separate batches of corn, wheat and barley proudly joins the existing Ozark Mountain Moonshine (Standard Proof). Aroma: Open and inviting offering of fruity grain. Flavor: Sweet buttery corn, toasted wheat, with caramelized barley. Body: Full and smooth, mid tongue heat with lots of curves. Overall: A Bold whiskey experience that draws you in and takes you on a journey! Beginning with clean aromatics, moving into fresh grain flavor, growing into tingling warmth and richness that eventually fades leaving a mysterious glow. Most commercial spirits produced today are so rectified that they have a relentless blandness but this is far from the case with the “Overproof” Ozark Mountain Moonshine. Nestled between overgrown oak trees in the Ozark Mountains, sits one of the best kept secrets in Missouri – Copper Run Distillery, a small business growing deep roots. Copper Run is a boutique, artisan distillery that favors quality and refines the age-old craft of distilling into a drink-worthy art form. 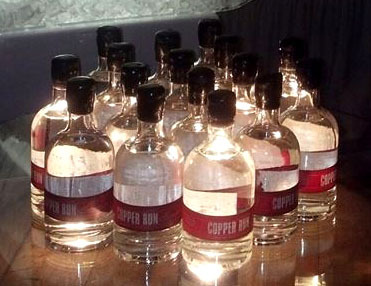 The Copper Run family of spirits is heavily influenced by local resources. Pure limestone rich water, Missouri white oak barrels, and the ever changing climate in the Ozarks create a unique distilling environment. From the beginning Copper Run’s White Whiskey (Ozark Mountain Moonshine) and aged Corn Whiskey won the silver medal from the American Distiller’s Institute in 2010. Today small batch production, imagination, and ever evolving practices come together making exciting new spirits. Small Batch Big Passion pays off with Gold!! Keep Warm for the Holidays!! NEW White Rum just in time for Summer! This weekends drink special is a Sour Apple Lemonade! Jukebox Winos play Saturday from 2 to 5 and Tony Menown and Seth Darby plays Sunday from 2 to 5!